During a recent trip through the mountains of Northern Leyte, I drove past some cows along the side of the road. My son got excited because seeing cows and horses is rather like big game hunting to him. Normally all that is there are dogs or kids or an occasional adult slogging along under this burden or that. “Look! Two cows!”, he exclaimed. Well, that’s fine and dandy, but he missed a third cow off behind a bush on the right. I thought it best if I informed him of the error of his findings. “No. There are three cows”, I said. And even today, when we rejoin the argument, he insists there were only two cows. Thus you have a clear understanding of the thinking that inhabits much of our discourse. What do we term it? Denial? Ignorance? Stubbornness? Intellectual blinders? You will see two-cow thinking in a lot of blog threads, especially those like GRP where advocates are not influenced by intelligence or consideration, but by point of view. Anyone supporting President Aquino in any way at any time is dismissed as a “yellow-zombie”. This is either phenomenal denial or deceitful manipulation. For a purpose. You will see two-cow thinking in wild ideas that people buy into, like the rumor that the U.S. planned the World Trade Center attacks on 9/11/2001, or manipulated Typhoon Yolanda into hitting the Philippines. Or that buying 12 round fruits or drinking rose water for the New Year will bring good fortune. Imagination becomes more real than reality. Yet this form of thinking is not really ignorance, as if the thinker were simply missing information. It is rich with information passed along as suspicion or folklore or what the rest of us might call superstition. Ignorance, when ideas are formed without important information. It is innocent. Deceit, where views are professed because the person making the argument wants to achieve a goal. Facts are of secondary importance. “Spin” is the political equivalent. Superstition, where information is there but it is imaginative and detached from any semblance of factual support. Perhaps there are other varieties as well. Our environment becomes surreal when so much of this illusion – lack of facts, deceit and superstition – becomes the primary thinking used to guide people’s acts. What kind of hallucinations guide North Korea, or even China, when they plot their deeds, issue their extortions, and raid other people’s territory? What kind of thinking is the NPA brand of advocacy that sees destruction and terror as constructive and good? How does the notion of compassion or consideration of other peoples get so easily set aside. How do legislative plunderers serve the state one day and dip their hands into the taxpayer till on another, and then truck off to worship at church on Sunday? How many cows are they seeing? What delusions are they feeding themselves with? The two-cow thinker is excellent at blames and excuses. It is better to lie and deceive than speak the truth. It is better to be strong and wrong of argument than get caught making a mistake. And, to be truthful, two-cow thinking can often be a good way to accomplish a goal. The child’s two-cow thinking is innocent. The adult’s two-cow thinking is much more elegant. And sometimes eloquent, in a conniving, base way. A teary-eyed mayor testifying to a Senate committee to try to lay the blame for a city’s suffering on the President. Accused plunderers issuing their finely crafted denials. 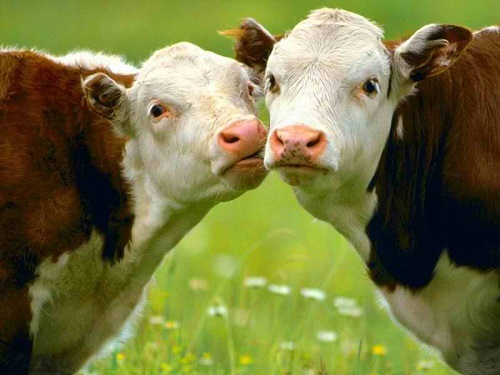 The legal profession is largely built on two-cow advocacy if you think about it. It is a profession founded on winning in spite of the facts. Indeed, it seems that in the Philippines, the notion of justice is a complete illusion. Mass media filling us with superficial sensationalism. Debate after debate becomes about the debater rather than the issue. The debater defends and attacks for motivations that have precious little to do with being forthright, or with problem solving. Sometimes I slap my head in amazement. Do such people really take us for being complete idiots? Are we idiots? What is the idiot quotient around here, anyway? And then there is this: I confess that sometimes I pursue my own two-cow advocacy to make a point. What else is satire or literary word-smithing but a form of mind-twisting? For expansion, I say. For mind expansion . . .
What is the takeaway from this blog? The constructive idea? Well, it is partly to express my consternation about all the destructive and dysfunctional two-cow thinking hereabouts. The Philippines is a huge intellectual minefield. Simply huge. Two few cows, way too many mines . . . It seems to me we ought to walk in this field fully alert to the dangers around us. We ought to try to spot the two-cow thinkers. The innocent, who are simply missing information. Perhaps we can inform. The manipulative, in the many forms they take. Perhaps we can control our own anger if we are aware that pushing buttons is what some people like to do. Perhaps we can identify the person with an agenda, or the person defending his esteem. And we can bring the discussion back to point. The superstitious and hallucinatory. Maybe we should run like the wind to find high and stable ground far away from them. I tend to think that such people, rather like a guy high on LSD, cannot be reasoned with. To be straight – to speak with all my cows on the table – I must confess that I find considerable amusement when I am able to spot a two-cow thinker. Heh heh. Makes my day . . .
We should all become highly skilled at counting cows I think . . . It is a higher form of mankind, an observant and precise cow-counter. Sometimes people lack the information because they are wearing blinkers or too dark shades. Sometimes it’s just perception, in “Thinking, fast and slow” Daniel Kahneman explains how our brain can play tricks with reality. Often after telling it over and over again, one starts believing that he really saw only 2 cows, it’s like self-hypnosis. Sometimes the 3e cow was a calf or a bull and it is more about semantics. We can talk about a different reference space or time frame too. Sometimes it’s us who took a shadow for a real cow, and we know that we are always correct. Sometimes it’s a difference in facts, sometimes a different logic or different formula is used, and sometimes it’s just the characters that are too different to come to any sort of common understanding. But what you said is so true and in the heat of the discussion I seldom see it, only on the way home it becomes clear what type of difference I was discussing and why. Philippine cows are scrawny leather on bone it seems to me. So, yes, not the best place to worry about how many they are. You present the situation well, the distortions we represent to ourselves. I’m fascinated by it. One can be a raft in an ocean of misinformation or a power-boat that propels through the deceits and ignorance with head up and a sense of purpose. Being in the information business, I want to do the latter. I’m fascinated by the “information base” that exists in poor communities in the Philippines. It is chock full of thin thinking and superstition and conclusions arrived at from pass-along rumors or TV news. It’s scary. So many votes. So little clarity of thought or purpose. Yet I don’t want to become a stuffed shirt intellectual elitist who believes he has the only right answers. In defense of your son – he saw what he saw. Two cows. You saw what you saw. Three cows. You can say he missed the cow behind the bush and he can say you were hallucinating. Unfortunately you didn’t turn the car around to actually count the cows and settle the dispute once and for all and so you and your son were, in effect, simply expressing contrary opinions.You will be arguing until the cows come home and become steaks on your plates. 🙂 Similarly that’s what happens with political debate in this country. A lot of time and energy is wasted because we put opinions ahead of verifiable facts, subjective perception is substituted for objective reality – two or three cows? Excluded from my comment are liars, those who deliberately deny, misstate, and/or misrepresent facts. Liars are not allowed in the conversation. ahahaha “until the cows come home” Very good. Interesting points. Yes, I suppose my son’s perspective did have a particular kind of validity. But when we are problem-solving or making important decisions that determine the well-being of the nation, the subjectivity and miss-impressions should be minimized, rather as a good investor studies the numbers before putting his money down. As for liars, it seems to me that some professions perfect the art of misrepresentation in order to achieve a goal. Bloggers do that, for one. I think there needs to be a value judgment attached to the “goal” of the lying. Is an attorney who distorts the truth to free a guilty client doing a good deed for society or bad? Is a fable a lie? Furthermore, I have seen comments of Get Real Philippines regulars calling for the death of Noynoy. What kind of sick twisted person would think like that? And I am perplexed why the moderators tolerate it while they counter all pro-Noynoy arguments with mockery and insults. They are not intellectuals. They are thugs and bullies. What a great irony considering they pride themselves as “trying to improve the Filipino people”. Yep. You have that right. Hey Joe!… do we have to milk this topic? You don’t Eric, I do, because I have to figure out what kind of communicating environment allows VP Binay to ride so high in the popularity field. Maybe I’m complicating it though. Maybe the way to stay popular is not to do much at all. 2. VP Binay is identified with Makati. Did you see the malls? The buildings? The subdivisions? If he becomes president he will lift the whole country in a similar level. 3. VP Binay cares for the OFW’s, my ate is an OFW, we all depend on her. 4. VP Binay is strong, even his son, look how he demands respect, look how even the Dasmariña people are afraid of them (and his vigilantes?). 5. VP Binay has a lot of political friends in municipalities and barangays all over the country. Interesting. No wonder he connects. It is also interesting putting other candidates against him in each of those qualities. LP’s problem is huge I think. Binay is “The Filipino Prince.” He is machiavellian through and through. I think that is called EPAL now-a-days and he has mastered this form of mass manipulation to a despicable degree. Mass media plays a large role in shaping public opinion, but what can we do to those who don’t have access to alternative news and opinions? Types 1 & 3 will only fall prey to type 2. Here’s the beef, when mass media (Type 2) is akin to a dairy cottage industry all we can do is to learn the art of cow spotting to separate the cream from the scum, but what else can we do, cry over spilled milk? Even if our future is at steak?… or to only hope that somehow we fall buttered side up? I think the shaping of a culture takes place in little steps of enlightenment. If we only hope, we aren’t doing enough, I think. US racial equality, such as it is, took 20 years or more for a material shift to evolve, and that was with powerful opinion leaders pushing. We need opinion leaders pushing for people to make good decisions based on the well-being of the Philippine community. Not self-interest. Our sense of community is dying, self-interest or the cult of individualism is the current religion. To blindly sacrifice almost anything for self-interest is the order of the day. When it’s okay to flaunt wealth, talent or influence to make us feel important. Even in times of calamity and tragedy our leaders couldn’t even set aside their egos. How do we beat mass media who virtually acts as PR for corrupt public officials, big business that destroys the environment etc.? Yes, little steps even if it takes a hundred years. Maybe we need to focus more in what we all have in common than the things that make us individually unique. Very sharp synopsis. Focus on the commonality is good, and take pride in diversity; develop respect for people who choose differently than us rather than criticize them to justify ourselves. A big step, I know. I’m on a track here with a couple of blogs. The next one talks specifically about President Aquino. Then one regarding the “Culture of Criticism” that seems to exist hereabouts. I want to elaborate on a few ideas. Have we milked this enough? My insipid jokes tend to spoil the discussions most of the time. Sometimes I wish you were more brutal with your replies. Can’t wait for your next for your next topics. Just sent you an email, Joe. Got it, thanks. Will respond directly. Happy new year! You know, Joe, I’ve noticed these what you call “two-cow” thinking among radio announcers. When someone goes to the station and complains (against an employer or a company , for example), the announcer would, before hearing both sides,air out his biased-assumptions. The vocabulary would almost always consist of “greedy” “businessmen” “capitalists” “maltreating” “poor” or something along those lines.. The announcers would always paint an overly dramatic picture of oppression, sometimes by manipulating background music to push the complainants to tears. And it bothered me so much, I stopped listening. Being media people, you would think people are more responsible about the things they broadcast. Businessmen are not always evil. Legit businesses are good for the country. And poor people, even those who cry their eyes out, are sometimes wrong. Happy New Year to you, ikalwewe. Radio and TV “talking heads” are indeed inclined to speak first and think later or not at all, as the more trouble they stir up, the more angst and pathos and tears, the better the ratings are. A radio talk show host in Los Angeles brought this to my attention a number of years ago when he got candid and said, “hey, I’m an entertainer, not a news guy”. Yep. And we ought to be dismayed at what we find entertaining. The only cow I saw when I was there was tethered to a cart belonging to a traveling vendor who sold handicrafts. That irrelevant observation out of the way, I could see how frustrated I will be if I go back there and engage in a discourse with “two cow” thinkers. The cliche, “can’t see the forest for the trees,” comes to mind. There are just so many internal and external blinders and/or factors needed to be exposed and taken away before the “two cow” thinkers can have a revelation. Most of the local cows are recycled shoes, leather on bones. I don’t know if it is the heat or diet. Mindanao has some cattle ranches so maybe the fat ones are there. Indeed, whacking at trees is a national pastime. The forest seems taken for granted. Or taken for a ride . . .